Comparison chart for current EVSEs, including ability to sort by price, cord length, max amps etc. Excellent list of usage scenarios to aid in deciding which EVSE to get, as well as information on “how to purchase”, and an extensive list of available EVSE’s. Nissan allows waiver to skip charging station install (search within page for “waiver”). Another list of charger manufacturers. Quick220, a quick way to have a 220/240V outlet. And why it won’t work with GFCI outlets. The Leaf has a 110/120V trickle charge cable (“OEM EVSE”) that works with the onboard charging system Nissan Leaf FAQs, at nissanusa.com. Here is a pic of the OEM EVSE’s label, showing the manufacturer as Panasonic, and a current draw of 12A. The OEM EVSE would only work on a grounded outlet. It tests the outlet and if it’ not grounded, the green “READY” light will blink and it will not enable charging. If the OEM EVSE will not charge, you can try using a GFCI outlet tester or a receptacle tester to test your outlet(s) to identify issues such as being ungrounded, hot/neutral reversed, etc. Some recommend to not use a GFCI outlet to with the OEM EVSE because the the GFCI breaker may trip, due to a slight amount of leakage current in the car. If that happens, charge on a non-GFCI grounded 120V outlet. Leviton makes a GFCI outlet designed specifically for charging EVs. 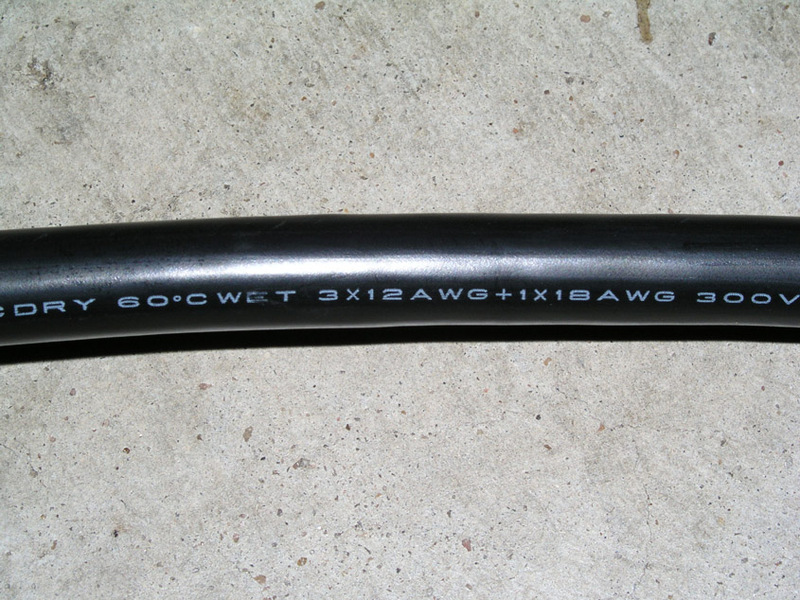 Here is a table showing amperage rating (“ampacity”) of wire sizes in AWG. LEAF OEM L1 EVSE charges Leaf, not Volt. Volt OEM L1 EVSE: Charges both cars. Blink L2 EVSE: charges both cars. Plugged in “using an appliance extension cord” for four months so far. List of some charger manufacturers. evseupgrade.com can modify your stock 110V L1 EVSE to also work on 240V: send in your stock 110V L1 EVSE and they will modify it and send it back, for a fee. (The service’s “proprietor” is a member of the mynissanleaf.com forums; he has written an extensive description and explanation of this modification; the original forum thread is here.) After modification, the OEM EVSE can charge at 2.88 kW on 240V, versus at 3.3kW at 120V with a “normal” 240V EVSE (for instance, an AeroVironment EVSE). Be aware that the modification changes the stock Nissan EVSE’s three-prong NEMA 5-15 plug into a NEMA L6-20 twist lock plug. You will need to order the optional “NEMA 5-15P (Edison) plug to L6-20” adapter to charge on 120V. 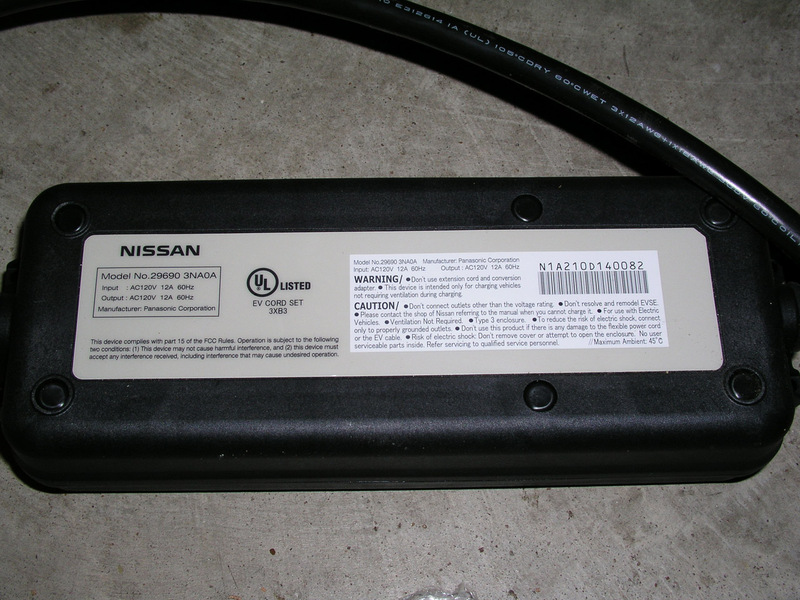 Yet another forum member offers plugs for use with the modified EVSE. As of Oct 2011, as many as 15% of the US’s 7000 LEAF owners have had their OEM EVSE modified by evseupgrade.com. During Level 1 charging (120V), the battery coolant bubbles, “like a teakettle”, thought battery temperature seems normal. The coolant overflow tank is full and the coolant is “quite hot”. Neither fans were running. Dealer “properly got the air out of the HV coolant system (inverter, charger, and motor)“. No fault codes were registered. The car was then charge on L2 for about an hour without exhibiting the symptom. However, the problem persists. Finally, dealer determines that “Junction Switch in Battery Control Module failed”; it’s replaced. Problem solved. Nissan/AV L2 EVSE not charging Interwiki: mnl++: AeroVironment EVSE won’t charge car.